On 19th March 1899, Charles 'Cheers' Wakefield set up an oil company in England. Ten years later, he produced a new lubricant that would revolutionise transport in the first half of the twentieth century. He called the new oil Castrol. Castrol oil has become synonymous with world speed and endurance records. From the early days of Malcolm Campbell's land and water speed records, Captain Alcock's non-stop Atlantic flight, to the Mars Rover, Castrol has remained at the cutting edge of technology. With unrivalled quality and exceptional performance in the most adverse conditions, Castrol oils remain the number one choice of motoring pioneers today. In the early 1990's Castrol steered the re-introduction of their early lubricant grades designed for veteran, vintage, classic cars and motorcycles, and Castrol's Classic Oils was created. Castrol's Classic oil grades use latest technology, low detergent base mineral oils in the appropriate viscosities on which early vehicles were designed to run. Making the right choice of oil has now become simply a matter of looking in the owners' vehicle handbook for the manufacturer's original Castrol recommendation. Castrol's Classic Oil range is widely available throughout the UK, continental Europe and numerous countries worldwide. 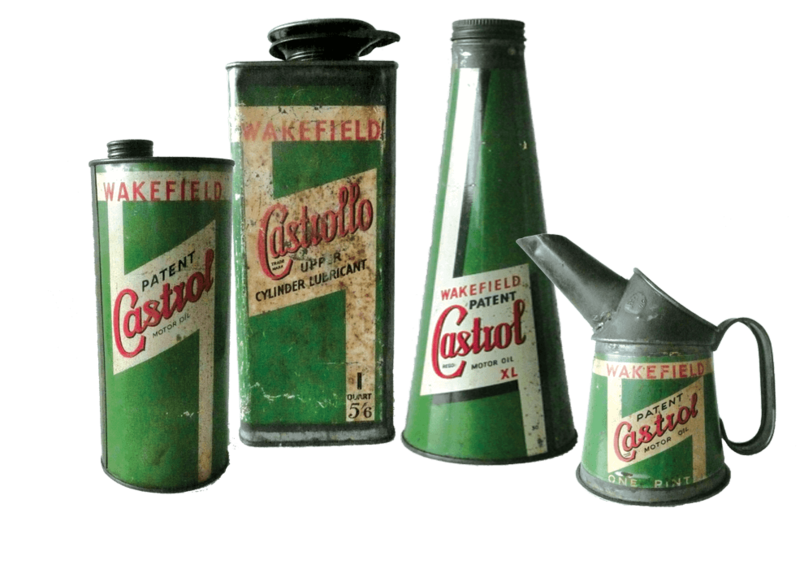 In 1899, Charles 'Cheers' Wakefield resigned from the Vacuum Oil Company, and founded C.C.Wakefield - later to become Castrol. He launched their first lubricant for cars in 1906, and the company has been at the leading edge of motor technology ever since. The new business was started at Cheapside in London, selling lubricants for trains and heavy machinery. Eight former colleagues from the Vacuum Oil Company joined Wakefield in the new venture. Early in the 20th Century Wakefield developed an interest in the latest motorised vehicles, the aeroplane and the automobile. The company started to develop lubricants especially suited to these new types of engine. The oils needed to be thin enough to work immediately from cold at start-up, yet thick enough to remain effective at the very hot temperatures produced by the high engine revolutions. Wakefield's researchers discovered that adding a measured amount of castor oil, a vegetable oil derived from castor beans, gave their lubricants the required properties for the harsh conditions imposed by these new engines. The new oil was named 'Castrol'. 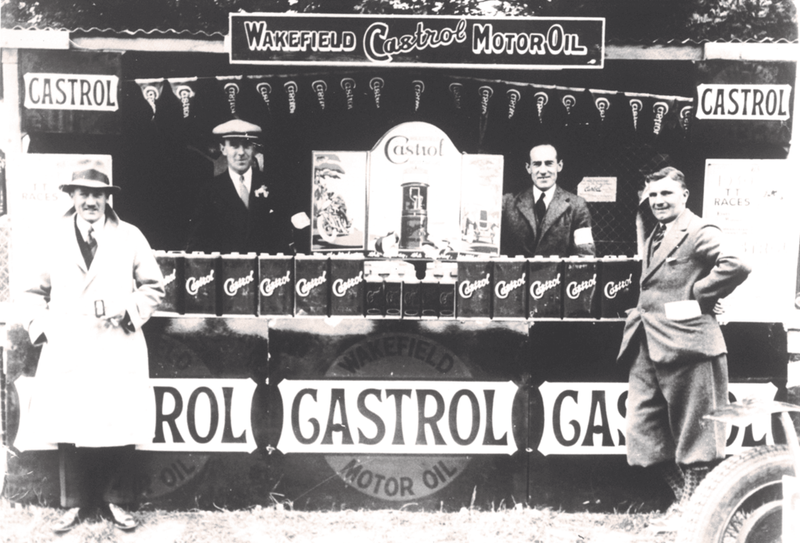 Having developed a new kind of motor oil, C.C.Wakefield now pioneered a new way to raise awareness of the product with potential customers. Wakefield's interest in competition and performance had led him to the idea of sponsorship. The Castrol name was advertised on banners and flags at aviation competitions, car and motorbike races, and speed record attempts. A mobile competitions department, pictured, provided support to these intrepid drivers and pilots. When a Castrol sponsored racer or record breaker won, advertisements would herald the victory, letting the public know that the winner had 'done it with Castrol'. During the 1920's and 30's, the land speed record was broken 23 times - 18 with Castrol in the engine. By 1960, the Castrol brand was so well known that C.C.Wakefield renamed the company simply as Castrol Ltd. The company remained at the cutting edge of lubricant technology, opening a state of the art research facility in Bracknell, and developing the product line to include oils specifically for car manufacturer's individual engines. In 1966, the company was bought by The Burmah Oil Company. 1968 saw the launch of Castrol GTX, to the great acclaim of both professional drivers and the driving public at large. By this point, Castrol products were available from service stations and garage forecourts in more than 140 countries worldwide. Castrol remained a major sponsor for motor sports and world record attempts - including the 1970 London to Mexico rally, where 16 of the 23 finishers used Castrol lubrication. In 2000, Burmah Oil and Castrol became part of the BP group of companies. Burmah Oil's operations were folded into the group, whilst Castrol carried on developing and selling lubricants under its own established name. Choosing the right engine oil for your veteran, vintage or classic vehicle is essential for ensuring peak running condition and maximum wear protection for your engine. To make this decision easier, Castrol produce a range of famous Classic oil grades to the correct formulations and viscosities as originally recommended by the vehicle manufacturers, but now using the latest technology, where appropriate, and low detergent formulations to protect your veteran, vintage or classic vehicle. Historically, many motor manufacturers recommend Castrol by name in their original vehicle handbooks and now today's owners are able to follow those original recommendations. Castrol’s oil recommendations for vintage, veteran and classic vehicles date back to the turn of the last century.